The JetPack. 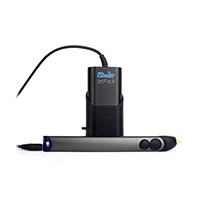 A portable power pack that gives you the freedom to 3Doodle on the go. Provides 2 hours of Doodling with ABS and 3hours of Doodling with PLA. It recharges in 3 hours and has a USB 2.0 interface.